Forming in 1986, Virus would go on to release an album a year over the next 3 years culminating in 1989’s Lunacy, their greatest achievement and an album that deserved far wider acclaim. If you’re a fan of frenzied riffs, killer gang-vocals and hooks that’ll snag you square in the chops, then Virus are your band and Lunacy could become your new favourite album. 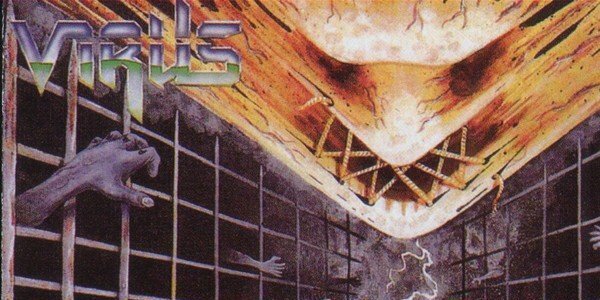 Capable of matching any of the 2nd tier American thrash bands, their bass-heavy, gritty and hyper-fast thrash should have reached a wider audience; a case of British thrash being overlooked in favour of the American contingent. Virus were a band with a fearsome live reputation and had the clout to make some serious noise within the thrash metal scene. They called it a day in 1990 but since their reformation in 2008, Virus have gone from strength to strength and a new album is imminent! As infectious as ever, Virus are very much active and fans of Vio-lence and Defiance will find much to love, check ’em out! If you liked this, check out: Force Recon (1988), pure ferocity and a UK companion piece to the feral likes of Dark Angel’s Leave Scars and Kreator’s Pleasure to Kill!